Life Energy & Technology Holdings Inc.
Home > All Other Industries > Other Industries J - M > Life Energy & Technology Holdings Inc. 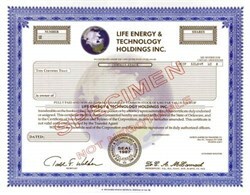 Beautifully engraved SPECIMEN certificate from the Life Energy & Technology Holdings Inc. This historic document was printed by the Columbia Financial Printing Company and has an ornate border around it with a vignette of the eart. This item is hand signed by the Company's President/CEO and Secretary. Life Energy) is becoming a leader in the electricity generation and environmental infrastructure market worldwide. Life Energy's unique proprietary technology, EcoTechnology(TM)(2) as embodied in the Biosphere Process(TM) System, supplies energy through a profitable and environmentally safe process. The Biosphere Process(TM), a central part of the EcoTechnology(TM) system, safely and efficiently, processes traditional and non-traditional waste materials into electricity and other beneficial by-products. The Biosphere Process(TM), assists in solving the global waste problem by converting into clean, green electricity such waste materials as: Municipal Solid Waste (MSW), agricultural, effluent, medical, industrial, shale oil, sour natural gas and many other traditional and non-traditional waste materials.